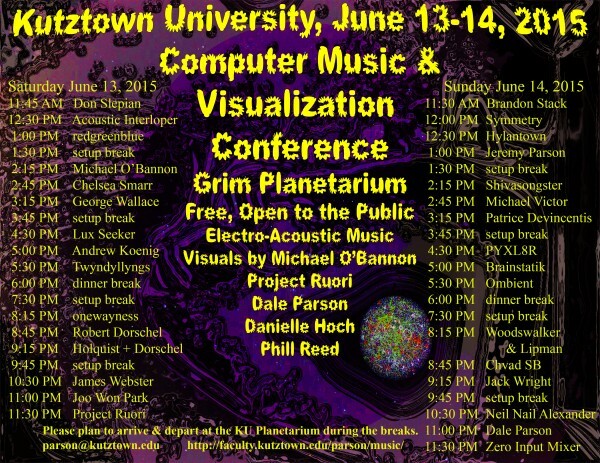 You are invited to attend in a 2-day electro-music satellite event in the Grim Planetarium, Kutzown U. of PA on June 13 & 14, 2015. There is a preliminary schedule of performers here, and there a few slots open, so please post here if you'd like to perform. Most of the performers on the initial list are electro-music regulars, many of whom have been talking with me for years about playing in the planetarium. Kutztown is about 90 minutes NW of Philly, between Allentown & Reading, PA.
Steve Mokris & Michael O’Bannon have agreed to do 1/3 of visuals each, along with 1 musical performance each. Students, colleagues & I will pick up the other 1/3. Intention is electro-acoustic, but a few exploratory acoustic performers will be fine. Plan is 30 minutes for each performance, with three back-to-back performances, interspersed with 45 minute setup breaks, and a 2 hour dinner break each day. That gives us time for up to 30 performances. The event is free, and the public will be invited to attend. Meals are not covered, but Main Street is a 5-minute walk. Apartment-style dorm rooms come in blocks of 4, and they are cheaper if we rent all 4 simultaneously. See notes from the conference manager at bottom of this message. I will schedule 3-day dorm reservations first in order to fill out blocks. The conference manager has not gotten back to me as of today, Feb 28, about the details for reserving room, but we are on her event radar. She is very busy. We should be able to stream the event, in which case we’d need streaming volunteers. $ 25.25 per person/per night (assuming single occupancy in a bedroom) $ 12.50 linen pack includes 2 towels, 2 sheets, 1 pillow case, 1 wash cloth (one-time fee, linen to be returned) $ 5.75 pillow (one-time fee, pillow is theirs to keep) $ 4.50 blanket (optional, one-time fee, blanket to be returned) There is also a cleaning charge for every suite that you use ($75-$80). It is probably easiest to consider filling each bed in a suite so you can charge $20 flat fee per person. If you only put 1 or 2 persons in an apartment, you still pay $75-$80 for the cleaning fee so it is best to fill the units as tightly as you can. There are a lot of electro-music festival regulars signed up to play, along with some non-EM folks and locals, which is part of the point. Lots of discussion on FB and none here, which makes this great for posting stuff not likely to get lost in the hurly burly over there. This post is especially for people doing their own visuals, especially real-time graphics. I know the projector takes VGA and HDMI. Phill Reed tells me that for anyone who brings a video in standard format such as MPEG, that he has software that will clip the corners correctly & project. MANDATORY CLIPPING TO A CIRCLE: Visual artists need to clip their graphics to a circle in the middle of Display 2 on their laptop. This clipping is not necessary for prerecorded videos (see above). Display 2 is 1920 pixels wide and 1200 pixels high. In order to eliminate the risk of hitting people in the back rows in the eyes, please clip your display to a 1200 pixel diameter circle in the middle of display 2. I am also attaching the Processing sketch (program) that I threw together tonight, between ordering a vegetarian calzone & going to pick it up, so I could look at angles and pixels sizes and such. It reports the 1920 x 1200 on the bottom of the code screen shot, which was taken simultaneously with the screen shot showing the image going to the dome. That image bears out the 1920 x 1200 pixle report. More to follow. Display 1 at 19:59:48 tonight. Display 2 at 19:59:48 tonight, from the VGA to the planetarium dome. 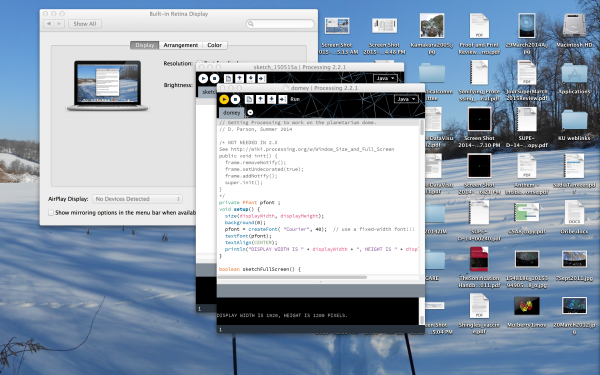 My Processing sketch code for these screen shots. 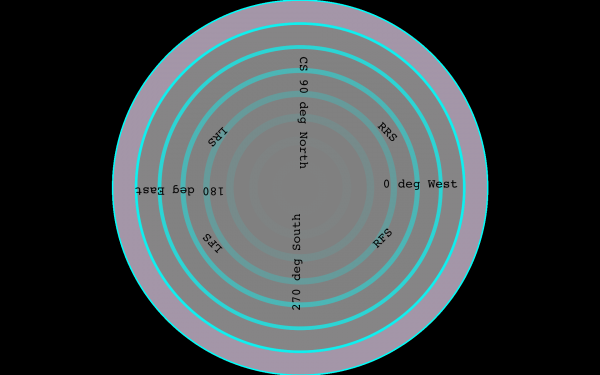 The planetarium markers show 0 degrees at North, but polar geometry conventions place 0 degrees polar -> right along the X axis in Cartesian, which projects to West on the dome. The diagram below showing speaker placement uses the planetarium's markers reference, while my software uses polar geometry. 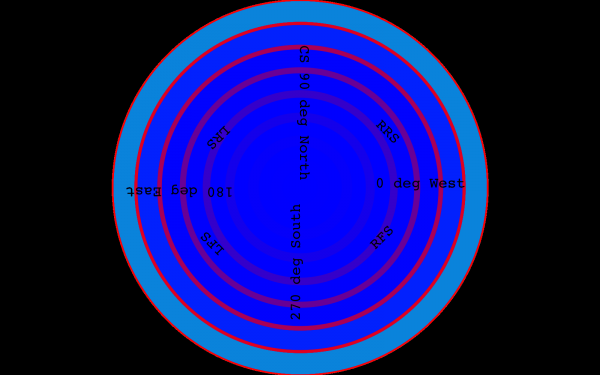 The angle increases in both as you go counterclockwise, they just start 0 at different cardinal directions. Display 2 on a laptop puts the bottom of the second "screen" to the south and top to the north, with west on the right and east on the left. Just lie on the ground with your head to the north, feet to the south, looking upward, and you will find west is on your right. Go ahead, just try it. 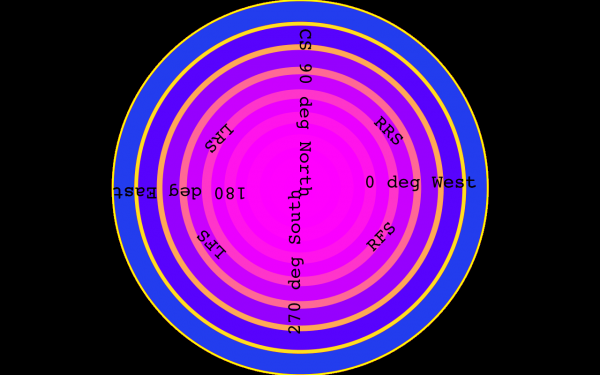 I always look to the south so I can set up my display 2, in case I need to use a mouse and look my cursor on the dome. The subwoofer is on the floor. Nobody knows quite where. This place is a Tardis. Fish eye photo, including my head. Here is an updated schedule. A name with an * suffix means that performer(s) have confirmed the time slot. I am working on getting confirmations from the remainder. Most of the discussion is on an event page on FB, but I am happy to coordinate any non-FBers here. Here is a draft flyer with a draft schedule for this event. There are schedule details here. April Fools' day edit: Updated the flyer. April 3 edit: Updated the flyer to use the word "planetarium." May 6 edit: Updated the flyer and the linked schedule. I may have said this further up: My plan is to record everything, get permissions, clean recordings up one performance at a time, and post the recordings here, incrementally, throughout the summer, for use in http://radio.electro-music.com and your listening pleasure. You are a great inspiration for setting up this sort of thing, Howard. Phill Reed & I just got grant funding (~$60K) for a laser projector to augment the current 1200 pixel diameter (SVGA/HDMI) raster projector in the room. We won't install that until later in the summer, and will have to learn how to use it. I will need to get an additional low-level programming API for me and my students. It comes with animation tools and a scripting language, but of course we want to get deeply under the hood. So, there will be even more we can do with electro-music visuals in that room as time goes on. This event will be very much an experimental workshop. The participants will learn a lot. I figure on doing something like this roughly once every two years, if all goes well. See you soon! Here are mixer presets. Picking one of these will make switching much easier than using custom mixes. There is little time to switch from one performer to the next in a 3-set. Config 6 is for performers who want full control of spatial sound. The mixer can adjust levels, but topologically speaking, it is a feed thru. Config 2 is for performers supplying a single stereo feed. 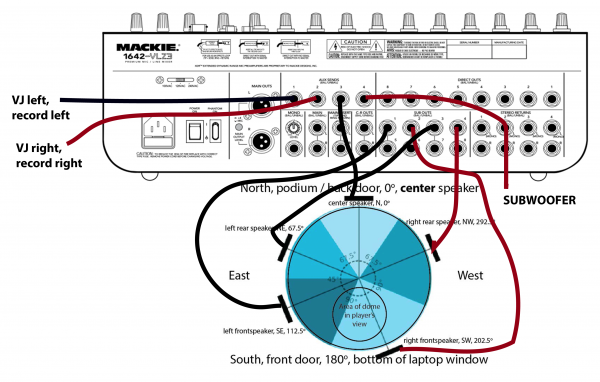 This is the planned speaker routing. Config 4a is for two performers with two stereo pairs who want to be mixed down to regular stereo as in the previous config. Config 4b is for two performers with two stereo pairs who want to get distinct speaker pairs as much as possible. Jeremy and I have used this for separate ping-pong delays from each of us to good effect. May 16, less than a month to go . . . Here are the main results of another study of the projector in the planetarium yesterday, May 15, 2015. Thanks to Michael O'Bannon for asking more questions. The attached photo shows the three resolution configurations that the planetarium projector presents to my new-ish MacBook Pro (2014) when plugged into the projector using either HDMI or SVGA. These settings come from the projector. Some specs for the projector are here. Look at the Full Dome column (not the Truncated column) of the specs. 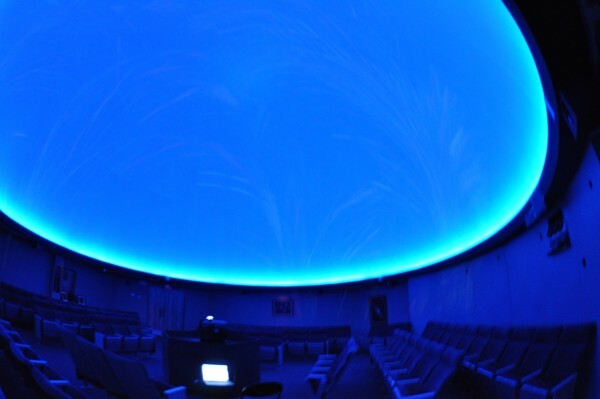 Our planetarium is full dome with circular seating. 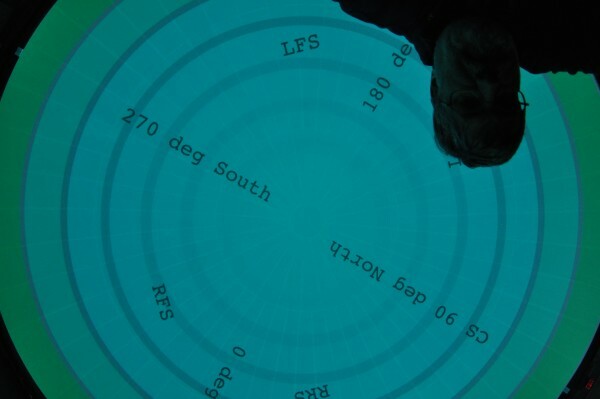 RULE 1 (CLIP TO A CENTERED CIRCLE): In fulldome mode the projector has a max resolution of 1920 X 1200, which you need to clip to a 1200 X 1200 circle that is centered in the display. If you plan on setting up at 1600 X 1000, then clip to a 1000 X 1000 circle centered in the display, and if at 1280 X 800 then clip to a 800 X 800 circle in the center if the display. Of course, 1920 X 1200 clipped to a 1200-pixel diameter circle gives the best resolution, as long as your laptop & software can drive it without stuttering using at least 30 frames per second. IF YOU DO NOT CLIP TO A CENTERED CIRCLE, YOUR PROJECTION WILL GO OFF DOME & BLAST PEOPLE IN THE BACK ROW IN THE EYES. The projector can project 15 degrees below horizontal. RULE 2: If at all possible, use HDMI instead of SVGA. Sometimes the 1600 X 1000 setting under SVGA shifted about 10 degrees to the west, and the 1280 X 800 setting always did so when plugged using SVGA. HDMI never had a problem on any of the three settings. Use HDMI. There are two additional photos attached to this post showing screenshots for both display from a Processing script that sizes itself to the display size of the dome projector, in this case for 1920 X 1200. Another post further down in this thread shows the other two settings. Assuming that electro-music does not resize images, the screenshot from the dome projector should weigh in at 1920 X 1200. Note that it is my responsibility to clip to a 1200 X 1200 circle in the center. 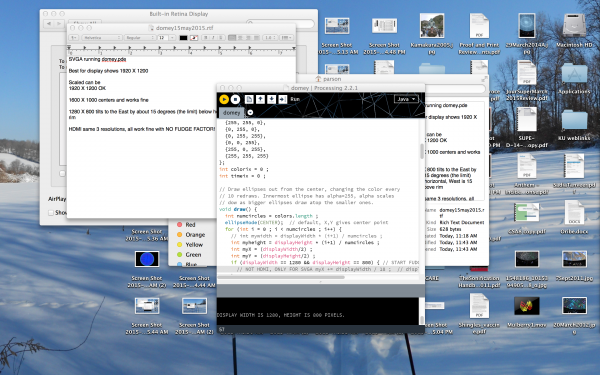 Here is the Processing script I used to study the dome. 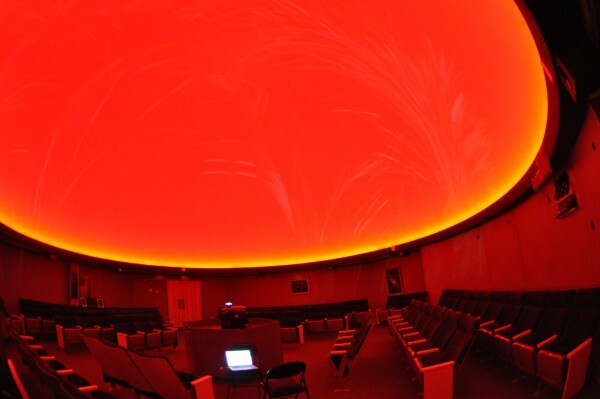 // Getting Processing to work on the planetarium dome. pfont = createFont( "Courier", 40); // use a fixed-width font!!! // Also from Preferences "Run sketches on display 2" for dome. // dow as bigger ellipses draw atop the smaller ones. * code must test for this return value and not attempt to plot it. // Physical requires Y == 0 to be at the top. * polar radius in  and the angle in radians in . * the return values are not outside the clipping boundary. 1920 X 1200 screenshot of the dome projector. It is your responsibility to clip to a centered circle. HDMI and SVGA both work OK at this resolution. Here is what my Processing script shows for the 1920 X 1200 screenshot. Here are screenshots related to previous post for 1600 X 1000 and 1280 X 800 projector settings. SVGA sometimes has offset problems for 1600 X 1000, and always does for 1280 X 800, so plan to use HDMI if you plan to down-scale to either of these two resolutions. This program does not scale the text point size to match the display. That accounts for the differing text offsets in these 3 screenshots of the dome (2 here, 1 above). 1600 X 1000 screenshot of the dome projector. It is your responsibility to clip to a centered circle. HDMI always works OK; SVGA sometimes offsets to the west. Processing source window for the attached 1600 X 1000 dome plot. 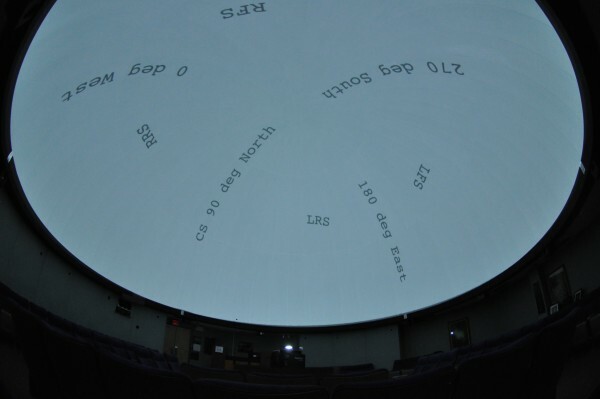 1280 X 800 screenshot of the dome projector. It is your responsibility to clip to a centered circle. HDMI always works OK; SVGA always offsets to the west. Associated 1280 X 800 Processing source screen. Updated flyer, moved Twyndyllyngs to Sunday evening. The schedule for visual artists is updated, too. 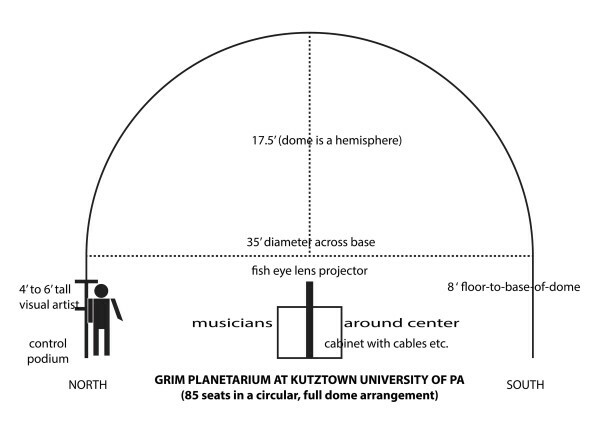 Visitor info here, conventional map here, Grim Planetarium is bldg. 11 on that map, unload in B1 and park in B2 if possible. I have to find out if we are allowed to park in B1. B2 is not far. EDIT May 26: Added Randy Brown to the Saturday schedule & flyer. Final schedule, updated May 26. It's free, plan to arrive during a break. I am posting an example of my planned June 14 11 PM piece so that Glenn Robitaille can get an idea of what I will be playing in planning his accompaniment. This trial run was a little too long. I have just had a reminder for anyone performing visuals: 1) no strobe lights (we have participants prone to seizures and/or severe visual migraines -- I am one of the latter), and 2) try to have a way to slow down motion that may not appear super fast on a conventional projection screen. If you have ever felt even a little motion sick in an IMAX theater, you understand. The dome size amplifies speed of motion. You run the risk of having a lot of people closing their eyes if things move too fast on the dome. Having a way to control speed is a good idea. A lot of diagrams on this thread, no? Less than 2 weeks to go! EDIT, FORGOT THIS: Michael O'Bannon wrote, "On the projector diagrams (electro-music forum), at what degree is the workspace for the VJ's?" I replied as follows. I don't know whether the VJs will use the podium at the north, or whether I will set up a table nearby. I will configure tables for both options. In any event you will be somewhere near that north side of the circular wall, with eyes somewhere between 4' and 6' above the floor, depending on sitting versus standing. We have high stools at the podium, although I think lower is a little better. Clearly, the only way to see everything would be to be in the center of the room, lying on your back, except then the central podium would block the view. For sitting or standing, the edge is better. The VJs will be near the north wall, and the musicians will typically be near the center. For my 11 PM Sunday set in which I will do both visuals & music, I will be in VJ position. The projector is not 8 ' high. 6' is approximate -- I haven't measured it, but I have reached out to remove the lens cap often enough. 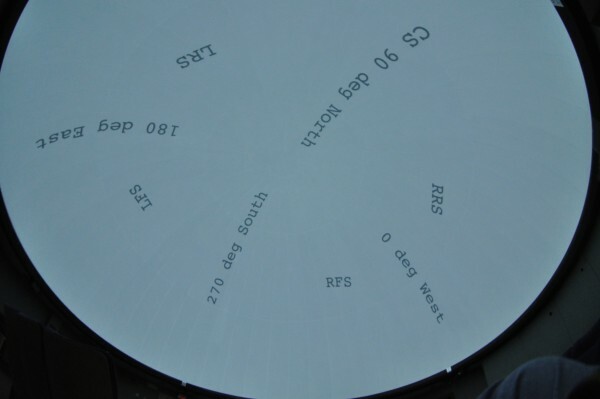 It is adjusted so that the height of its rectangular display just covers the dome N-to-S with 1200 pixels; the bottom of the computer display is south; width overshoots the dome unless you clip to a circle with a radius = display height. The podium under the projector is somewhere between 4' and 5' across. Again, I haven't measured it, but I was curled up inside of it the other week, looking for the HDMI jack. It was pretty cramped in there. 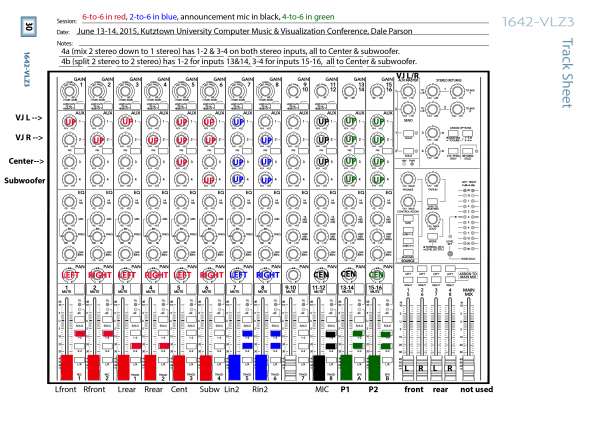 EDIT 2: Updated mixer diagrams after testing & debugging. Glenn will be performing with me at 11 PM Sunday. Updated flyer. Dale, thanks so much for hosting this excellent, and hopefully FIRST annual event, at the Kutztown University Grim Planetarium. Robin and I thoroughly enjoyed all the great music, video presentations and all the people. Thanks to all the video artists who worked hard and performed throughout the event and of course all the wonderful performances! Robin and I LOVE the electro-music family !! You and Robin are most welcome here any time. I was very happy to see you both at the event. Thanks for your extremely valuable help working through the sonic popcorn and amp shutdown issues that, happily, affected only a couple of sets. I am also glad that you got to be part of the Zero Input Mixer collaboration, which for me was one of the weekend's high points. Someone was playing call-and-response with me from across the room during ZIM. I strongly suspect it was you. I don't know how much of the dome you could see during that set, but from my side of the room the sonic visualizer played by Emily Hoch made it look like we were shooting fireworks onto the dome. My plan is to post photos on FB within the next week, with a link from here, and to post recordings here after getting artist permissions. The recordings will probably take me most of the summer to complete. See you in Huguenot! Take care. Someone was playing call-and-response with me from across the room during ZIM. I strongly suspect it was you. LOL, ahhh yes, it was me indeed. Was funny that our extreme sonic impulses required the services of Phil to man the power switch of the power amplifier in efforts to keep the music going !! I don't know how much of the dome you could see during that set, but from my side of the room the sonic visualizer played by Emily Hoch made it look like we were shooting fireworks onto the dome. I did manage to sneak a peek and it was pretty cool Emily did a great job ! Do you have any recommendations on what I should do about that, or about improvements to the sound system in general? I am taking suggestions, because there may be grant money available near the end of the year. I knew it was you! I started varying my timing, just to be certain it was call-and-response. I said to Emily, "I bet that's Bill." and some Day 2 photos of the event here. I recorded the whole thing. My plan is to post recordings in this thread throughout the summer as I get to them, after getting artist permissions. Do you have any recommendations on what I should do about that, or about improvements to the sound system in general? Dale, the use of the consumer grade multichannel AV receiver was probably the weakest link in the audio chain. As time passed I, and I believe yourself and Phil, became convinced that the amplifier was entering shutdown possibly due to heat build up but more probably because of levels greater than what the amplifier could sustain. With that being said, we will need Phil to assist in providing the specifications for the passive speakers that we need to drive in terms of their power & impedance ratings. From there, I recommend suitably rated class "D" amplifiers to drive these speakers. Class D amplifiers are light weight, withstand "Pro" audio levels, very efficient, and run cooler than other amplifier topologies. A good amplifier example would be the CROWN XLS series. Only two (2) channel units for Front L/R and Rear L/R and one more mono amplifier for the Center Channel. A 200 - 300 watt powered SUB can be used in place of the passive unit mitigating the necessity for another outboard amplifier. Most amplifiers have built in signal limiting also thus no external units are required. Thanks, Bill. I'll get with Phill on getting the speaker specs before electro-music 2016, and we can continue the discussion. The head of our grants office stopped me Monday when I passed his office after getting the planetarium back to normal (including testing the speakers -- no audible damage to them or other components that I can hear), and told me to make sure to apply for a research grant late this fall, because there are some extra funds this year. I will have to write a research proposal, and assuming it has something to do with multi-player collaborations, I may just have to do one of these events again. While we are reviewing, let me know what you think of the high color saturation of the linked color photos, relative to how colors appeared to eyeballs at the event. Do you think it's because of CCD color sensitivity, or exposure time relative to eyeball time, or something else? There has been some discussion of that since I posted the photos. Have fun with your other hobby this weekend! The existing projector is color-disc DLP, right? (I remember seeing rainbows as I flicked my eyes across the room.) Over time the gels in the spinning color disc may fade (from saturated to transparent), resulting in lower saturation, so one relatively-inexpensive option might be to check the color disc and replace it if it's out-of-spec. Another option would be to replace that projector with a 3-chip / non-color-disc projector. In my experience those tend to produce more vivid colors.